Tripp Lite 6in DVI Digital Y Splitter Cable DVI-I M to DVI-D F and HD15 F 6"
Tripp Lite's 6-in. 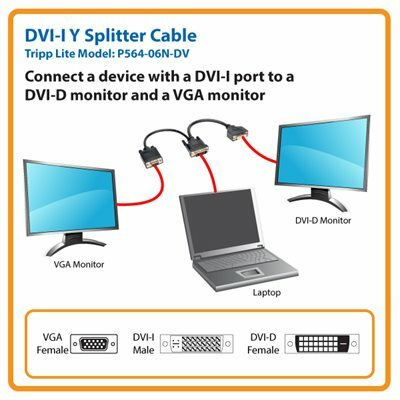 DVI Y Splitter cable provides an inexpensive way to split the video signal from your PC's DVI-I port to DVI-D and VGA monitors. Supports computer video resolutions up to 1920 x 1200, and HD resolutions up to 1080p (60Hz) Comparable to Wyse 920302-02L and Dell 0X2026. Don’t settle for less than the best—enjoy superior video quality! The 6-in. P564-06N-DV Y Splitter Cable ensures peak performance when displaying a single video signal on 2 monitors simultaneously. Unlike cut-price cables, the P564-06N-DV is manufactured to exacting specifications, using superior materials, for a difference you can clearly see. For peace of mind, the P564-06N-DV comes backed by a lifetime warranty and has a green, RoHS-compliant design. Features a DVI male connector for a computer and a DVI port and a VGA port for connections to monitors, the P564-06N-DV splits the video signal from your computer for display on 2 monitors simultaneously. It’s an easy, affordable solution for displaying the video signal from a notebook computer during presentations. The P564-06N-DV is manufactured using top-quality materials. Double-shielding with foil and braid provides maximum EMI/RFI protection and superior signal quality. The DVI-D connector and the VGA connector have integral strain relief for durability and reliability. The P564-06N-DV supports computer video resolutions up to 1920 x 1200 and HD resolutions up to 1080p (60Hz). The P564-06N-DV is manufactured in compliance with strict RoHS specifications, reflecting Tripp Lite’s commitment to environmental responsibility. For peace of mind, it comes backed by a lifetime warranty.